Kenny Thompson does it all behind the scenes at Advanced Eye Care in San Antonio, Texas. Dr. Luisa Thompson, his mother, is the optometrist at the head of the practice, but Kenny is the vice president of operations and handles all of the practice’s equipment financing needs. 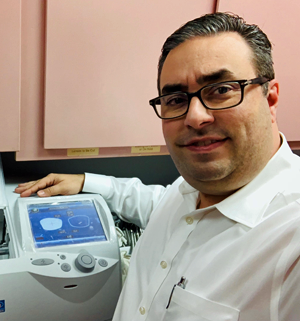 When the Thompsons decided to do all the edging for their patients’ lenses in house, they turned to Stearns Bank for the new equipment after having great experiences in the past. Kenny went to Stearns Bank client relations representative Stephanie Breth with his proposal for the financing on the edger. After a few emails back and forth, the financing was worked out before Kenny went to a tradeshow to officially purchase the edger. The edger is helping Advanced Eye Care expand its scope of offerings and solutions for its patients. Kenny has been working with Stearns Bank on Advanced Eye Care’s financing needs for the past five years. The flexibility and creativity that Stearns Bank provides him is why he keeps coming back and working with Stephanie. “We’ve gotten creative with customized financing a few times. One time I was getting a $4,000 rebate on some equipment and included that in a down payment. I ended up structuring that deal to take care of the rebate at the beginning of the term and then paying the balance for a term that best suited Advanced Eye Care. Stearns Bank isn’t wishy-washy. They’re willing to work with you, and get creative if needed,” Kenny said. Advanced Eye Care and the Thompsons are looking to expand their practice even more. And, when they need to make a call about financing, they know who they will turn to.